Need to have surgery in the dentition and the bones around it, is possible to be found with many people. This is a stream in medical and dental science, which requires high degree of specialised experience to undertake restorative surgeries in some of the sensitive areas of the face. Also known as Oral and Maxillofacial surgery in India, the work of maxillofacial surgery seems to be an integral part of the cosmetic surgeries, performed for giving better looks to the facial areas, including the maxillary bone and dentition and then the skin above it. In different areas of India, maxillofacial surgeon in India is practising the work of maxillofacial surgery in the dental clinics and hospitals. It wouldn’t be wrong to say that maxillofacial surgery needs to collaborate with other surgical specialities, such as otorhinology, plastic surgery and general surgery. As per medical definition, maxillofacial surgery is meant to treat many disease conditions or defects in the regions of head, neck, face, jaws and the soft and hard tissues of the face and maxillary region. It also deals with the aesthetic issues of the tissues in the maxillofacial region. For want of simpler definition, some people in India say that this surgery is rather the orthopaedic treatment of the face and jaw bones. Under the technique of maxillofacial surgery in Delhi dental clinics, a number of procedures are performed. These mostly include surgical techniques, where facial region bones and tissues are involved and people can get restorative surgeries due to this. Some surgeons in Delhi dental clinics use their expertise in maxillofacial surgery to carry out the dental implant procedures. In case of patients requiring minor surgical procedures on an out-patient basis, this can be provided by this particular specialisation. There are also few other operative procedures performed by maxillofacial surgeons in Delhi. Jaw alignment with orthognatic surgery, facial and jaw reconstruction after cancer surgery, realignment of facial bones after trauma, looking at the prospect of aesthetic or cosmetic surgery and in the minimum level, this speciality clinic can also provide tooth extraction procedures. Primary activities of maxillofacial surgeon in Delhi in the dental clinics are in plenty, and all of these, deal with surgical procedures. These can be categorised under dentoalveolar surgery, cosmetic surgery of the head and neck, maxillomadibular advancements and many other surgical operations. Our dental clinic for maxillofacial surgery in Delhi is highly equipped with best quality surgical instruments, where the maxillofacial surgeons are part of a big team of dental specialists, as well as otorhinologists and plastic surgery specialists. As Dentists in Delhi region, we have well established practices of working in groups, with specialities as required. For this reason, you would find a detailed list of various dental specialities visiting our establishment. 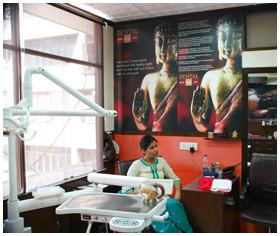 Medical and dental streams have their separate offices, with state of the art, diagnostic centres. X-ray and CT scans of face, head and neck are very necessary to analyse the cases of maxillofacial surgery. For this reason, we have put in a system, were the patients are first checked by the doctors from different surgical streams, and then for final diagnosis and surgical planning, the diagnostic radiology is brought into fold. Besides the string of dental specialists, there are many doctors attached to the clinic in Delhi, who look after the patients post-surgery. This includes many medical specialities like cardiology, anaesthetics, ENT specialists and plastic surgeons. Sometimes, maxillofacial surgeon in India is associated with a larger medical college in Delhi, but he also provides his services in clinics in other parts of India. Costs of undergoing maxillofacial surgery in Delhi are usually quite high. This is because of the long procedures and surgeries. Sometimes, in Delhi clinics, we have to operate in different stages. Different specialities need to work on different aspects of the surgery and hence, the patient is called for more than one time. Due to the elongated procedures and number of specialities involved, the total costs can get quite increased. Furthermore, this may depend on the kind of damage and distortion of the face. Simpler surgeries can cost a few thousand rupees in dental clinics in India, while complicated surgeries can run into few lakhs rupees. In our set up in Dental clinics in Delhi, we have the required resources for carrying out different kinds of maxillofacial surgery, with high end equipments and the necessary skills of the doctors. Supporting them in their surgeries is a bevy of nurses, support staff and coordinating members. With maxillofacial surgeon in Delhi working in many places in dental clinics in India, it is nowadays an easily accessible field and plenty of people are getting benefited by it.